ABS short for ‘acrylonitrile butadiene styrene’ a tougher styrene form, very common in manufactured items, usually found in model shops as dark-grey construction strips or girder structures. Not so available in large sheets. absorption casting is a method of filling a porous plaster mould with a liquid, water-based material such as clay slip or latex. It is a traditional method, but still a standard one in pottery manufacture The plaster absorbs the water and the material forms a shell which becomes a hollow casting once the excess liquid material is tipped out. 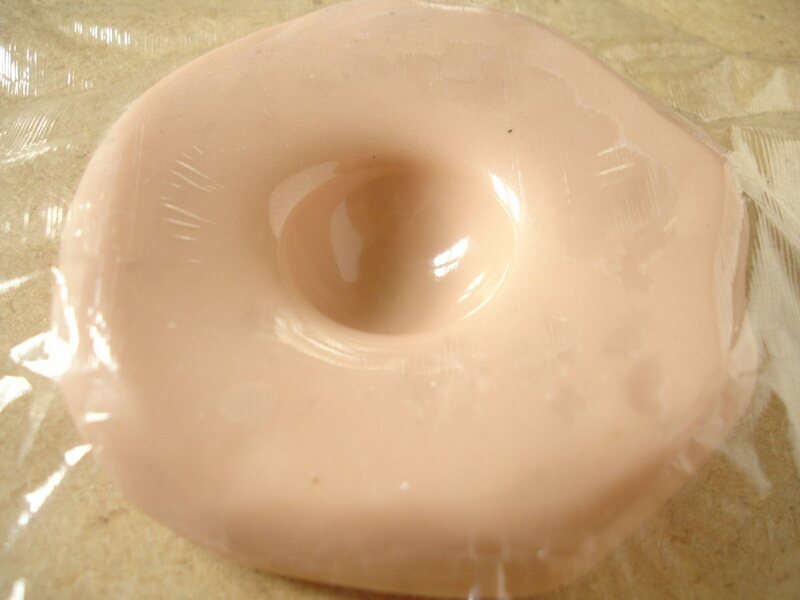 Care must be taken that the plaster mould remains porous, so Vaseline cannot be used as usual as mould release from the prototype. Mouldmaker’s soap or washing-up liquid are alternatives. Specially porous plaster needs to be used i.e. ‘pottery plaster’ and the moulds need to be bigger to take account of shrinkage if size is crucial. Advantages Light, hollow castings and economical use of material, with no wastage; an even structure; possible solution for thin/concave forms; allows casting in ceramics; allows work on surface in ‘leather’ hard state; minimises problem with trapped air in castings; thickness and strength can be controlled, according to how long mould is left filled. Disadvantages limited to rigid plaster moulds; up to 10% shrinkage dependent on material; danger of damage when de-moulding; needs to be watched re. topping up the mould while shell is forming; little flexibility re. undercutting unless multi-part mould is made. acetate clear plastic sheet more commonly used (A4-A3 size) in the past for creating OHP (overhead projection) visuals or as clear film to protect artwork. Usually thin i.e. 0.13-0.25mm. Ideal for representing glass in architectural models. Best to fix with double-sided tape as using superglue will cause ‘fogging’. Useful to represent gauzes in models esp. if organza is smoothly spraymounted onto it. Acetate can also be printed on (if it has a special coating) to suggest painted gauzes. It can also be roughened (very fine sandpaper or even kitchen scourer) to make surface less shiny or a little more opaque and this surface will accept acrylic in some cases. acetone is widely used as a solvent and cleaner; present in many paints (particularly spraypaints) and some glues; used for thinning polyester and epoxy resins, will clean up uncured polyester, polyurethane and epoxy; pure acetone will dissolve superglue but only before it hardens completely; will attack and dissolve forms of styrene plastic inc. styrofoam, polystyrene; good degreaser of surfaces such as metal prior to painting; can be used as a releasing agent for transferring a toner photocopy (not inkjet print) to another surface. Obtainable see entry in ‘Solvents and thinners’ in the Materials section for current prices and suppliers. Fast-drying, water-based paint with acrylic polymer as a binder, most familiar as artist’s acrylics in tube form. Many other paints can be labelled ‘acrylic’ but may have different composition i.e. not necessarily water-based, for example newer types of acrylic spraypaint. acrylic retarder is a colourless gel medium which slows down drying of acrylic paint making it much more ‘workable’ and transparent (if required) for ‘scumbling’ and glazing. Obtainable art shops. Price Winsor&Newton c.£8-10 per 237ml tub 2014 Winsor&Newton may have discontinued it’s gel retarder in favour of a liquid version. Spectrum gel retarder £5.77 per 125ml, also Screenprint Gel £6.98 per 250ml (2013). Alginate is a flexible mouldmaking material used primarily in life casting. It is skin-friendly, fast-setting and reproduces skin detail amazingly, but very fragile (compared to silicone) and normally has to be used immediately to make just one casting in plaster. For more see ‘Quick view comparisons of mouldmaking materials’ in Materials section and the post ‘Casting polyurethane resin into alginate’ November 9th 2012. Alginate contains a gum, sodium alginate, which is derived from algae (brown seaweed); jacket support necessary since it will rarely hold its shape on its own. 5/11/2012 tests done using Industrialplasters.com slow set alginate (CSM college shop £10.80 per 550g). Can be mixed for pouring consistency by adding 2-times volume of water. 100ml (firmly tamped) of alginate was mixed with 200ml of (room temp) water until it was a thin ‘custard’ (this ratio made roughly 200ml of set mix, so alginate volume is doubled). Mixing was easy with medium-sized painting brush. Mould was demoulded after 15mins, released easily, accomodates undercuts but material is fragile (very like tofu). Good reproduction, some air bubbles. The mould surface was dried with a tissue and carefully vaselined. G26 PU resin mixed and poured. After 20mins resin set as normal and there were no indications that it had been affected by the moisture content. The Industrialplasters.com alginate can also be mixed as normal, equal volumes alginate and water for a spreadable, stronger mix. alginic acid derived through an industrial process from brown seaweed. This is then converted into sodium alginate which is a food-safe gum widely used as a thickener or gelling agent in food or cosmetics. It is responsible for the impression-making properties of the alginate used as a mould material for dentistry and life-casting. Here it is combined with various filler materials. Aluminium wire Because relatively soft, even thick aluminium wire can be bent easily making it ideal for sculptors’ armatures etc. Cuts easily. The best choice for bendable puppet armatures, although always test bending tolerance beforehand (2 twisted strands of 2mm wire make a good, longer lasting, but still bendable support). Can be found either in circular or square section, often sold by weight rather than length. Aluminium wire can be soldered together (requiring special flux and solder) but this can be problematic. For armatures hot melt gluing with wrapping of garden wire also works very well. Obtainable see ‘Quick view materials info’ under ‘metalwork’ in the ‘Materials’ section for current prices and suppliers. armature an internal structure meant to support modelling clay while sculpting a form, most commonly in bendable aluminium wire. It also refers to the movable skeleton inserted inside a stop-motion puppet which is often engineered in steel with ball-and-socket joints. Armatures for modelling are not just there for physical support, but just as much as a guide indicating where to model. Sometimes a ‘back iron’ is needed to take weight off the armature itself when modelling a large figure. ASA (acrylonitrile styrene acrylate) another common form of styrene plastic sold as a model-making material though not normally in sheet form, more familiar as pre-shaped (i.e. square, rod or half-round) strips and most often white. balsa wood Fragile as constructional material, better suited in combination (i.e. as cladding over a stronger structure in Pvc or card) or as easy means of making wood shapes which are not structural. Rough sanding will create fibrous surface, wire brushing will increase this effect. Quite difficult to sand down ‘against’ the grain, much easier along it and slices easily. Stains well with regular wood stain (though spirit-based infiltrates much better) but it may be difficult to obtain a dark, rich colour. Obtainable see ‘Quick view materials info’ under ‘constructing’ in the Materials section for current prices and suppliers. Bartoline ‘Clean Spirit’ marketed as a ‘water-based alternative’ to white spirit or turpentine, with a minimal solvent content (below 8%). Bartoline claims that it will clean both oil and water-based paints from brushes and can be used as a degreaser. It is apparently odourless, non-flammable and classed as non-toxic. I haven’t used this yet myself (it and other odourless versions of white spirit are comparatively new) but will update here as soon as I do. One thing I can say though is that if it is water-based it obviously can’t be used as a thinner .. it’s just for cleaning. Obtainable see ‘Solvents and thinners’ in the ‘Materials’ section for current prices and suppliers. bicarbonate of soda or ‘baking soda’ can be dropped into superglue to make it set instantly. It fills and bulks out the glue making it more ‘gap-filling’. It is also a good way of building up ‘ice’ effects in a model. binder the ingredient in paint responsible for three important things: holding the other ingredients (pigment, solvent etc.) together; the adhesion of the paint to a surface; the eventual hardening of the paint. For example in acrylic paints it’s an ‘acrylic polymer’, in artists’ oil paints it’s usually linseed oil. These binders can usually be found separately if one wants to make one’s own paint. Bioresin claimed to be a non-toxic alternative to the more harmful resins such as polyester, derived from sunflower seeds. ‘1775 fast’ version £40 per kg average (Canonbury Arts, 2013). Non-toxic clear resin. Mix 1:1.5 resin:hardener by volume (Biothan/Biodur), pot-life c. 4mins. Vaseline inhibits setting. brass most commonly available metal for small-scale work, in a variety of strips, tubes and sheets. Not as pliable as copper but much softer than steel. The most suitable for soldering. Can be cut (if thin) by scoring with a scalpel. Obtainable see ‘Quick view materials info’ under ‘metalwork’ in the ‘Materials’ section for current prices and suppliers. Cabosil is ‘fumed silica’, a powder commonly used as a filler for resins but which can also be used to fill or toughen silicone rubber. Dust masks should always be worn when working with any form of crystalline silica to prevent breathing in! Mountboard/- good for basic walls but will warp if painted, will need strengthening and not suitable for slender detail (e.g. window struts) because it will break apart. Scale problem if used for fine work. Good for chamfering i.e. cutting a slanting edge as in passepartout frames. Other ‘mountboard-like’ cards, may be tough to cut. Greyboard/- or similar cheap recycled card. Harder to cut. Stencil card/- ‘oiled manila’ cuts cleanly, paints without too much warping, stains well. Finnboard/- very soft, perfect for quick mock-ups (off-white helps), can be soaked/curved. Made from 100% wood pulp. chopped strand mat is a form of fibreglass matting in which short strands of glass are compacted together with a temporary binder, rather than woven in a regular lattice. There is a light version weighing 300g per sq metre and a heavier at 450g. Natural clay e.g. ‘grey clay’ £11.88 per 25kg from Tiranti (2014). Very suitable (and inexpensive) for general modelling or embedding for mouldmaking, if only temporary. Grey ‘modelling’ clay recommended, because terracotta is often much stickier and can stain. If still ‘workable’ (i.e. still relatively moist) no barrier agent needed with silicone or Vinamold, but a dry or even ‘leather hard’ clay prototype would need greasing with Vaseline before silicone is applied because otherwise clay traces can be very difficult to remove from the cured mould. Hard clay can be revived by spraying with water. cling film (‘plastic wrap’ or ‘Saran wrap’ in the US) is ultra-thin, stretchable plastic (PVC or polyethylene) sheet usually used to wrap food, mainly to prevent drying out. So-called because it partially sticks to itself making a tighter seal. The stronger ‘heavy duty’ type is useful for wrapping tightly around a mould to bind it together, instead of rubber bands. It is also effective in preventing natural clay from drying out. There are other uses relevant here too! For example, when building up a silicone rubber skin on a prototype it is always better if the final surface is kept as smooth as possible and this can often be difficult to achieve once the silicone starts to get stickier. An easier method of smoothing, once the silicone has been roughly spread on, is to cover with a piece of cling film and work it about through the film, as shown below. Once the silicone has cured the cling film can be peeled off. The same method is also effective when modelling with other materials, particularly when trying to achieve smooth and streamlined surfaces with very soft materials. Below I am using a wooden ball to transfer a concave shape to Super Sculpey but I didn’t want any of the woodgrain with it. 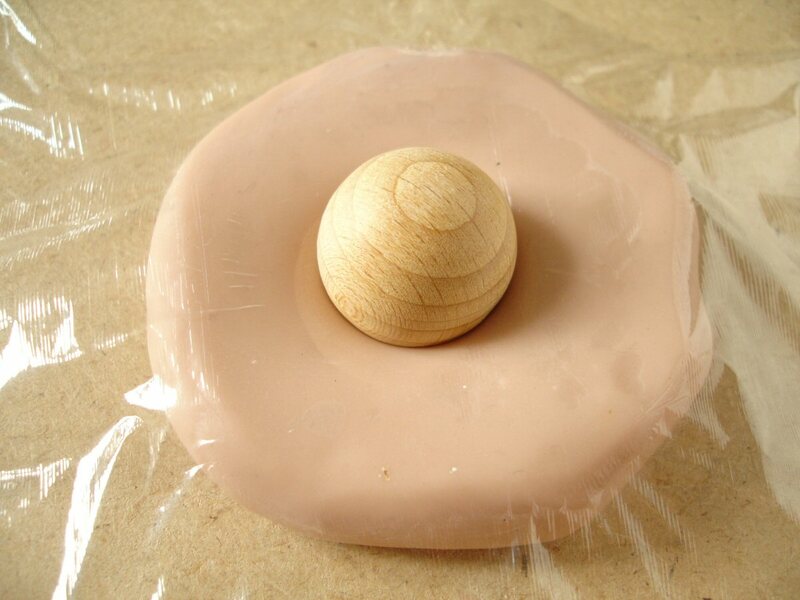 The cling film is first stretched evenly over the Sculpey before the ball is pressed into it. The cling film also smoothes out the edges around the shape. cold metal casting is the recognised term for describing the technique of filling resin with metal dust to give the surface of a casting an authentically metallic appearance. This is usually only a surface layer, firstly because that’s usually all that is needed and secondly because real metal powders are not cheap. Once the resin has fully cured the surface has to be ‘cut back’ or burnished (usually using steel wool) to bring out the metallic shine. The proportion of metal filler to resin in this surface coat needs to be quite high for it to burnish properly and look like the real thing. Recommended easy method is to mix a small amount of resin with a little over the same amount of metal powder by volume. The finished surface not only looks like real metal but behaves like it in some respects i.e. after a while it may need re-polishing because it tarnishes. 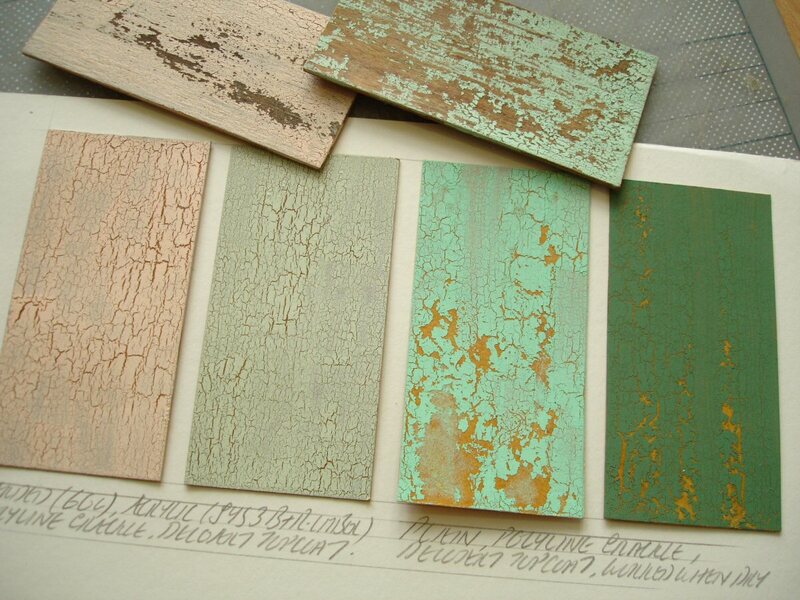 Special agents can be used to enhance this, especially when creating a true verdigris patina on copper for example. Although a reasonable effect can be achieved with polyurethane resin it is dulled because the resin is opaque. The full effect can be better achieved using transparent resins such as polyester or epoxy. conditioning a modelling material such as Super Sculpey means working it for a while between the fingers (or even using a device such as a pasta maker) until it has achieved its maximum malleability and uniform softness. This should be done with most modelling materials even if newly bought. But especially old Sculpey, even if has become hard and cracked, can be revived by rigorous kneeding and afterwards it will retain this softness for days, sometimes weeks. If Sculpey becomes particularly hard (meaning that it’s lost a significant amount of its plasticizer) a little Sculpey diluent should be added while conditioning. cork in granulated form (fine, medium or coarse grades are available) as scenic, scatter material or added to paint to give it a texture. 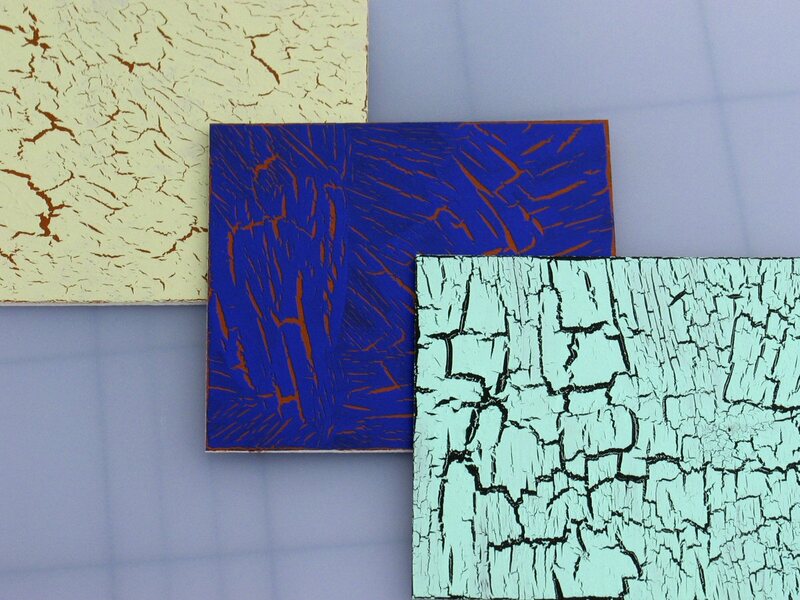 cracking medium (also known as ‘crackle’ or ‘craquelure’ medium) is a special glycerine-type coating which, when applied between two layers of paint, causes cracking of the top layer. In actual fact, although the result looks like cracking, it takes place immediately while the top paint layer is still wet, because the glycerine layer prevents the paint from anchoring and as it dries it starts to contract, pulling itself apart. This will continue until both paint and glycerine layers are completely dry. Obtainable for current suppliers and prices go to the ‘Materials’ section, then ‘painting’ for the ‘Quick view materials info’ page. Method the subject surface is first painted, usually with a dark colour which is left to dry thoroughly. The cracking medium is painted on as a second layer and when this is touch-dry another paint colour (usually lighter or contrasting) is applied as a third layer. The paint will start to ‘crack’ i.e. separate immediately. A lot depends on how the top paint layer is applied and what form of paint it is. The best results are obtained if the paint is laid on in quick, even sweeps without disturbing the cracking medium layer too much i.e. forcible stippling will not work, and without any over-painting (i.e. going over again). Using a brush will inevitably result in slight variations of paint thickness and the pattern of the cracking usually reflects this. Spraying is probably ideal if a thick enough paint can be sprayed. The ideal paint is not only fairly thick and opaque but should also not be too strong or sticky, because it needs to be ‘weak’ enough for separation to occur. Good results are obtained with the more liquid acrylics such as DecoArt Americana or DecoArt Crafters; cheap wall emulsion paint; or Reeves liquid tempera. Above, if both cracking medium and topcoat are applied as thinly as possible the cracking effect can be kept at a small scale. Areas can also be lifted off by scratching before the topcoat has dried. These samples were made on stencil card using the natural card surface as a colour base instead of under-painting. This will work if the surface is a non-absorbent one. curing is the term used to describe the hardening of mixtures, such as resins or silicones, which set as the result of a chemical reaction rather than simply drying by evaporation of a solvent such as water or ‘setting’ due to the crosslinking of like molecules. The full length of time that this takes is referred to as the ‘cure time’. cutting back is the term used to describe the action of working into the surface of a casting to expose what’s underneath. For example when metal filler is used in resin to give a metallic look the surface needs to be rubbed with steel wool to expose the metal particles and bring out the shine. Thanks for your hard work in writing this. Even if I won’t use a lot of it – it’s great to have such a good reference – Cheers.